Bruce Eaton, right, adjutant of the Drapeau-McPhetres American Legion Post 180, speaks at the New Brothers Restaurant & Deli in Danvers Square while the Rev. Timothy Clayton of Christ the Redeemer Church in Danvers and Peabody author Robert Kelly, next to Eaton, and New Brothers owner Kary Andrinopoulos, behind Eaton, look on during a 9/11 remembrance. 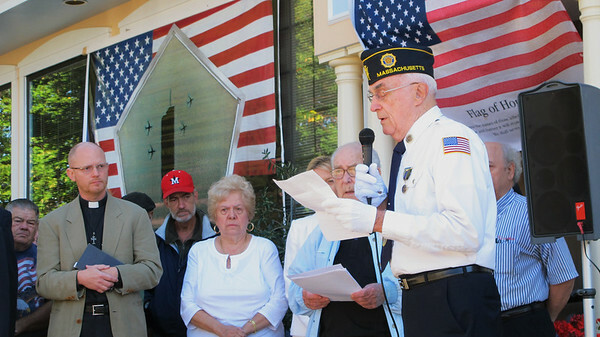 Photo by Ethan Forman/The Salem News, Sept. 11, 2012.